Frances Broehl Memorial No. 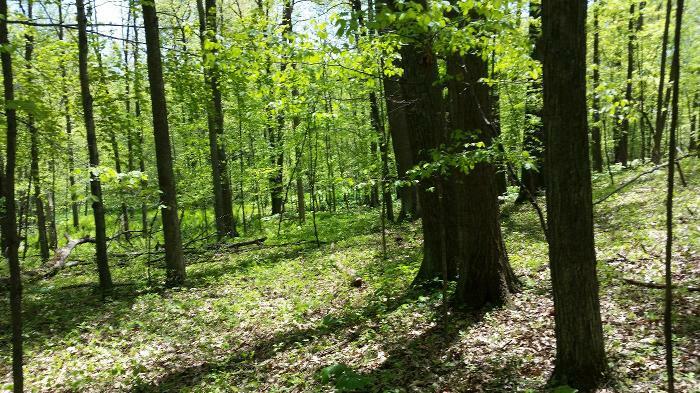 1 Nature Sanctuary was named for Myrtle Frances Broehl, a generous MNA benefactor who left a bequest in her will which helped purchase two sanctuaries in Lenawee County. The area was previously named Hostetler’s Woods, after the former landowner Don Hostetler, who was an early MNA member, chemist, amateur naturalist, and the host of an outdoor radio program. Broehl Memorial No. 1 is located in the Irish Hills, which were formed of gravel and glacial till deposited in moraines during the last ice age. The majority of Broehl Memorial No. 1 is forested, with a small 2- to 3-acre wetland in the southeastern corner of the sanctuary. The forest is primarily composed of oak-hickory with young beech and maple trees in the understory, indicating that the area is transitioning to a climax beech-maple forest. Broehl Memorial No. 1 is also home to yellow birch trees, butternut and a modest collection of wildflowers. Wolf Creek flows through the sanctuary and different species of trillium grow abundantly during the spring. The stream in the sanctuary leads down to a marsh at the woods edge near Onsted Highway. The marsh is home to tamarack, yellowthroat and mink. Visitors can access the sanctuary via a walking easement, which is marked with white diamonds. There are no trails, so visitors should come with a map and compass.